The short answer first: Luminosity- or Luminance Masks are a very powerful tool to select parts of an image, based on the luminance value, or in other words, the brightness of different areas in the image. Now what does that actually mean? Selecting a bright sky over a range of mountains using conventional selection tools, like the Lasso, in Photoshop is relatively easy. But what if we want to select the bright areas of the sky only? What if we just need to tackle the darker parts of the clouds? Or what if our perfectly exposed nightly cityscape just need some adjustments in the street lights and brightly illuminated windows? The other way around, what if we just want to lift the dark areas a little? This is where Luninance Masks show their full potential, because they allow us to select exactly the areas we want to and because they are masks, we do ot affect the rest of the image. How do we create Luminance Masks? I have created a Youtube video where I show you how to create Luminance Masks manually. 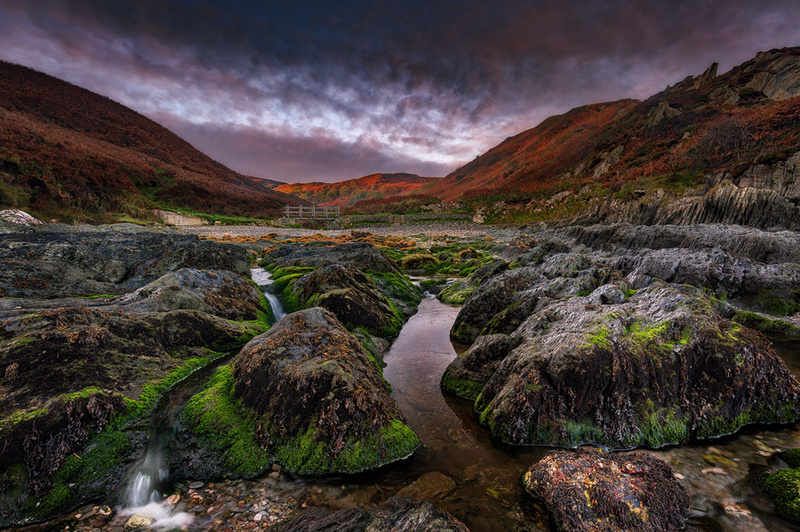 This tutorial is certainly not for all you Photoshop Pro’s out there but in many conversations with other photographers I found that a huge number hesitates to use these powerful tools, due to a lack of understanding. I am a strong believer that understanding the basics helps in the further development, which is why the video has been created. The aim is, to eliminate a good amount of the mystification, Luminance Masks are often surrounded with, by showing that it is not rocket science to create them. Before we use masks, we are going to create a range of selections first. This is confusing? Let me try clarify this. A mask in Photoshop lets parts of the image – or a layer – be visible or masks it out and makes it invisible. The white or bright parts of a mask let the underlying information be visible and the dark or black parts of a mask make the information invisible. The rule is: White reveals – Black conceals. So Luminance masks are actually a two step process. First we create a selection, based on the luminance information of the image. In the second step we are using this selection to create a mask – the Luminance mask. The image above appears a bit flat. So I used a luminance mask to only select the bright parts of the image and give them a bit more punch, using a curves adjustment. The image below is the result. Even though the changes are subtle, they have a huge impact on the result! Is there an easier way to get Luminance Masks? Of course there is an easy way to create them. Let’s face it, manually creating and deleting the selections and masks we need for each image we work on or even when we are changing to different layers, would really take the fun out of the process. I strongly advise to use a Photoshop action to assist you in a smooth and efficient workflow. A Google search would deliver quite a few results but you don’t have to run a search because right here you can download a set of actions directly. I have created them in a way I like it, straight forward without unneccessary and confusing functions. Just click the download button on the right to save the Photoshop actions to your computer. How to install the Actions in Photoshop? Identify the downloaded file OH_Luminance_Masks.zip on your computer and extract it (double click). Open the folder OH Luminance Masks and while Adobe Photoshop is running, double click the installation file OH Luminance Masks.atn. Now switch to Photoshop and make sure your Actions are displayed. If not, activate them by pressing Alt-F9 or in the menu under Window – Actions. Your new actions will be shown as OH Luminance Masks. Expanding the action set will reveal eight new actions as shown in the screenshot on the right. How to use the Luminance Masks Actions? 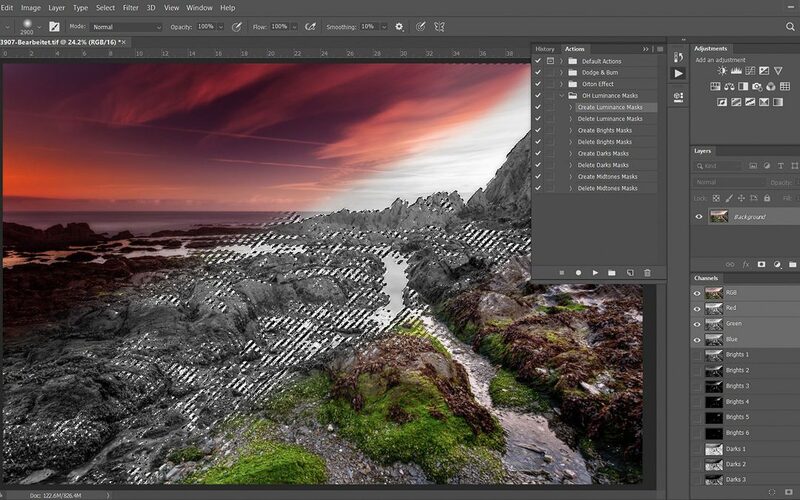 Load an image into photoshop and activate the layer you want to generate the Luminance masks based on. 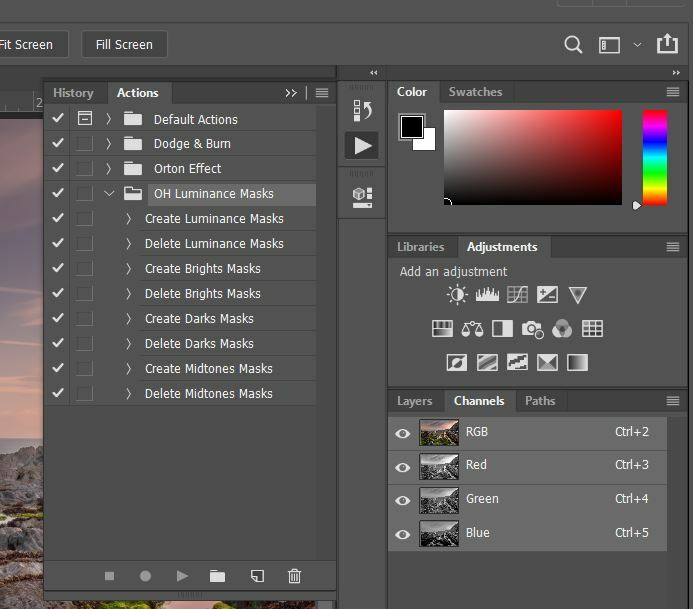 Then navigate to your actions and select Create Luminance Masks. Should that not be visible, expand the action set OH Luminance Masks first. Please make sure, NOT to activate the checkbox for toggling the dialogs on and off. The action will still work but you would have to acknowledge every single step. Trust me, you don’t want to do that. When the action is selected, hit the Play button (triangle to the right) at the bottom of the actions window, which will run the action and create your masks. 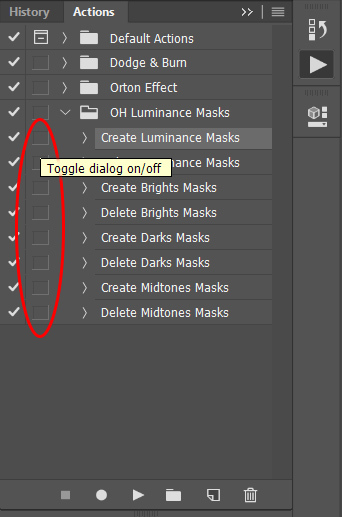 Now switch from the Layers Dialog to the Channels and three groups of luminance masks appear. These are the Brights, Darks and Midtones, each in six refinement steps. Click the channel that suits the part of the image you want to modify best, click and hold the Cmd Key on a Mac or Ctrl on a PC and left click the selection again. Voila, the marching ants appear, showing your selection, based on the luminance value of the selection you have chosen. Each Create action has a corresponding Delete action, which will remove the channels from your list. Removing them after you have finished your work is recommended to save disk space, because these channels add quite a bit of to the size of your file. You don’t alway need to create all three types of selections. Sometimes you know that you will only need the brights or the darks for example. In that case there is the option to create only them. Doing so keeps the channels list shorter and maybe less confusing. The selection can be used for a wide range of modifications, whether it is manual blending, applying adjustments like curves, etc. or any other modification. Diving deeper into the options is enough material for several tutorials, which are soon to come. That’s it for today, enjoy the work with your new set of Luminance masks actions!